Minnesota Historical Society Press, 9780873519502, 32pp. Rhoda is on a long, long hike with her aunt and uncle, each of them carrying backpacks of gear as they walk through the north woods. 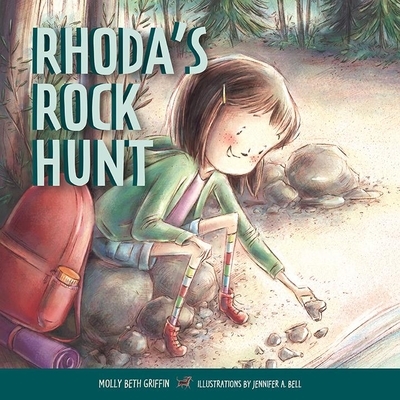 While Auntie June and Uncle Jonah watch for wildlife and set up their campsites, Rhoda is on the hunt for one thing: ROCKS. She finds them in all shapes and patterns, from hearts and hats to stripes and sparkles. And every last treasure goes into her pack, making it heavier and heavier as they hike through forests and along streams. Soon Rhoda is sweaty, and tired of salami sandwiches, and wishing for her own bed. Then, on the last day, they come to the Big Lake. And its beach is covered in rocks. Rhoda can’t believe her luck. After hours of play and even more rock discoveries, it’s time to head for home. By now Rhoda’s pack is too heavy to lift. Will she give up her rocks and return to the cabin for a real shower, a hot meal, and a soft bed? Or will she stay on the beach forever with her beloved collection? Her clever solution makes the most of her treasures—and offers delights for other hikers.